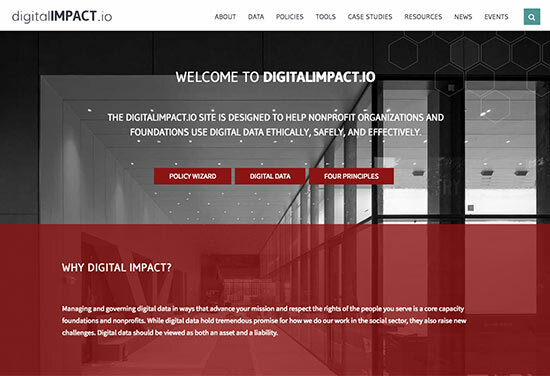 Lucy Bernholz and a team at the Stanford Digital Civil Society Lab have launched DigitalImpact.io, a web site full of tools and sample policies to help nonprofits and foundations use digital data ethically, safely, and productively. According to the site, “Digital data refers to the digitized form of any material – text, photos, videos, reports, databases, spreadsheets. In traditional economic parlance, digital data act like public goods. They are non-rival (lots of people can use them at once) and non-excludable (it’s hard to prevent people from using them even if they don’t pay) … Digitization of data allows for information to be shared, stored, re-used, and analyzed at a scale, pace, and time horizon that were not previously feasible.” This site will help you navigate the many questions you may have about how to manage such data in your organization.